It started as a place to gather and enjoy a shared hobby. Now, it's providing much needed help for a hurricane stricken town. Plainfield's BeeHive Quilt Group is pitching in to help make life easier for folks in Slidell, Louisiana, the village's recently adopted sister city. Nearly 100 hand-stitched quilts are being shipped to families in the city, which was devastated by Hurricane Katrina this summer. "When the hurricane hit, we started in," said BeeHive member Alice Kingsley. The quilters meet every Friday at the Plainfield home of Colleen Plucinski. Using simple, easy-to-stitch patterns, the group spent more than two months creating colorful quilts for both adults and kids. "What we didn't do here," Kinglsey said, "we did at home." Plucinski said group members, who hail from Plainfield, Bolingbrook, Frankfort, Naperville and Itasca, tried to make as many quilts as possible. While more complicated quilts can take weeks or even months to complete, the quilters didn't have the luxury of time. "These we made are a simple pattern so they went together quickly," Plucinski said, "because we didn't have time to waste." A pile of more than 20 quilts, including kids' quilts featuring Winnie the Pooh and Sponge Bob Square Pants, was also slated to be delivered to village of Plainfield trustee Jim Racinch, who is coordinating efforts to send the quilts to Slidell. While the bulk of the quilts will go to strangers, on BeeHive member sent quilts to a family that touched her. Maurene Siberz, Plucinski's daughter and a nurse at Edward Hospital, cared for a displaced Slidell family shortly after the hurricane. "One family had come into my clinic, and I just kind of connected with them," Siberz said, noting that quilts will be sent to all three children a well as their parents. 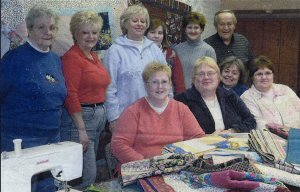 The Quilt group formed in 1999 as an outlet for experienced and novice quilters alike. "Some of them were quilting students of mine,' said Plucinski, "and we said, "Let's do a fun group',"
Plucinski has taught quilting classes at the College of DuPage as well as area fabric and sewing shops. Plucinski's husband, John, has been dubbed the group's official "mascot." "I'm the bee keeper," he joked. Racich applauded the ladies for their hard work, saying the quilts will be put to good use. "Life is good to us," he said. "But some people don't get their fair shakes." Plucinski said the group contacted Racich after learning the village had adopted Slidell. "I went to the (village), and they said, 'Bring them down,'" she said. "We know that they'll get down there and get utilized."